I just heard that Hasan Niyazi, my friend and fellow Art history blogger, died suddenly over the weekend. Hasan was from Australia and in the past three years, his blog, Three Pipe Problem (3PP), had become one of the most popular Art history blogs in the world. He was the son of Turkish Cypriots who had migrated to Australia when Hasan was a young boy. Like Raphael, his favorite painter, Hasan died tragically in the prime of life. His passion was the art of the Italian Renaissance. He claimed that his interest in Art began at the age of nine when he found a copy of a book by famed art historian Erwin Panofsky. I wonder if it began on the island of Cyprus under the eyes of the goddess Aphrodite, the beloved deity of the island. I first encountered Hasan when I commented on a blog post he had written for 3PP in July of 2010 on Giorgione’s “Tempest.” We had a spirited back and forth that showed that Hasan was willing to engage in debate but that he was also open to new ideas if they could be backed up with hard evidence. Even though he loved the art of the Renaissance, he had trained and worked in the sciences and believed that Art history should be subject to the same rules that governed the sciences. Our first encounter led to many more. He helped me immeasurably not only with his research into favorite painters like Raphael but also with the technical aspects of blogging. He was a wizard of design and had a great flair for using images in his work. He willingly shared his knowledge with me, a web newcomer. Eventually, he allowed me to publish some of my discoveries and reviews on his site. 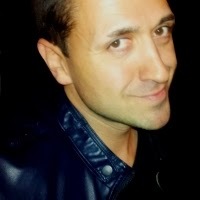 His site was growing by leaps and bounds and he gave me the opportunity to reach a much larger audience. It was not easy because he was a stern taskmaster and editor. We had many arguments and disagreements but I believe we both gained by the exchanges. When I sent him my interpretation of Titian’s “Sacred and Profane Love,” he chided me for not discussing all the previous interpretations, and eventually decided to do that on his own. It was a great example of web-based cooperation. Speaking of the Web, Hasan ended his last post with these words. The future of art history and the internet is a very exciting prospect. This goes beyond the fact that more art historians and institutions are engaging online, but also expands to include an increased public participation and interest in learning about art and history outside of an institutional and pedagogical content. The web allows quality knowledge, and fascinating images and video to be accessible everywhere, and by everyone--hence the potential for art history online is essentially limitless. As a small token I would like to dedicate my most recent discovery to the memory of Hasan. 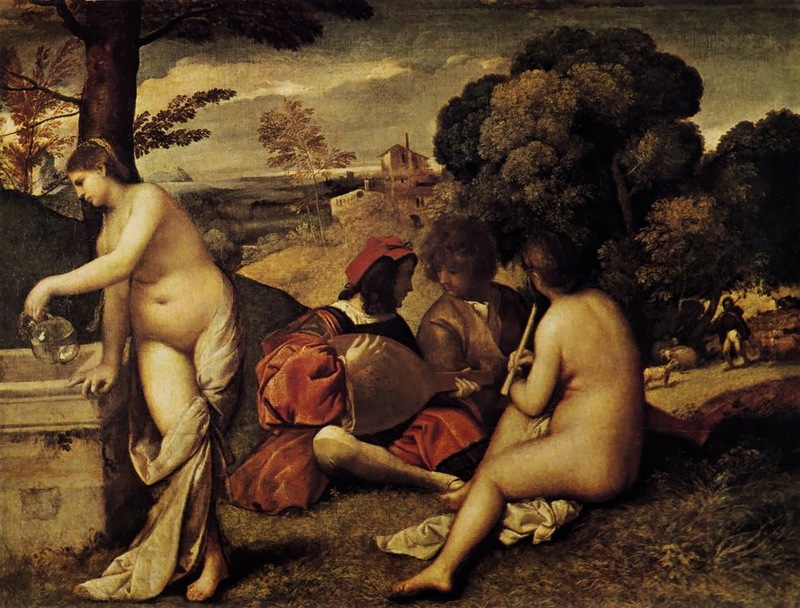 One of his favorite paintings was Titian’s “Pastoral Concert.” Earlier this year I sent him an advance copy before I posted it on my own website and blog. He read it and very kindly spread the word among his friends and followers. I interpreted the painting as Titian’s homage to his friend Giorgione on his sudden and tragic death at the age of 33. We never met and he lived on the other side of the world in a place he called, Oz. But he was a dear friend and colleague. 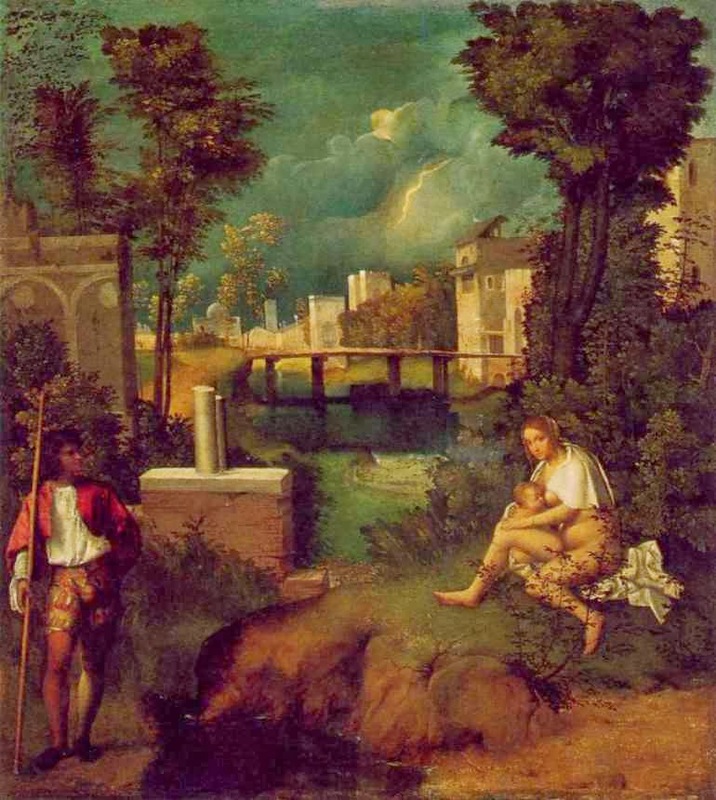 Renaissance Art Mysteries: Giorgione, "Saturn Exiled" or "Man of Sorrows"
Renaissance Art Mysteries: Giorgione “Saturn Exiled” or “Man of Sorrows”. In his 2009 Giorgione catalog Enrico Maria dal Pozzolo believed that a mysterious painting in London’s National Gallery might be the earliest surviving work by Giorgione. The painting features a forlorn looking man sitting on a kind of throne off to the right. Three young men are around the throne and one seems to be making an offering. To the left a leopard and a peacock are prominent. Pozzolo noted difficulties of attribution, and also mentioned that scholars have not been able to agree on a subject. Some think the Man is David or Solomon, while others suggest Jason, Zeus or an unknown poet. Pozzolo accepted none of these and offered his own new interpretation. He called it “Saturn Exiled” and argued that the painting represented the defeated Saturn after he had been castrated and exiled by Zeus. Pozzolo admitted that such a subject was unusual. I have interpreted this painting as a version of the “Man of Sorrows” one of the most popular and ubiquitous subjects of the era. See my June 25, 2011 post on this site. 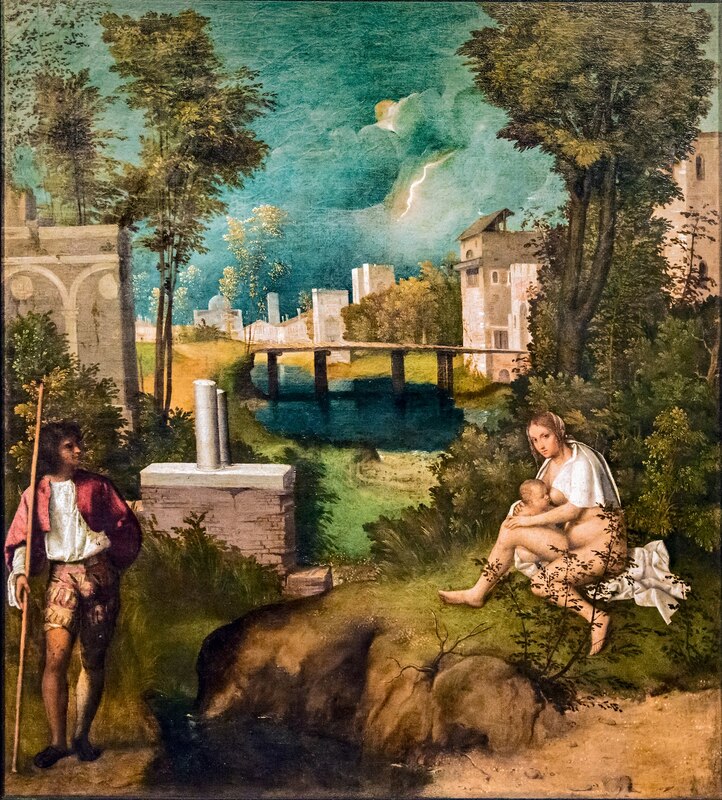 In the last few years I have sent my interpretations of Giorgione’s “Tempest” and Titian’s “Sacred and Profane Love” to most of the leading scholars in the field but with little response, and even less feedback and comment. I have also sent them to academic journals but with no success. So, I turned to the Web. I created a website and then this blog to publish my ideas and to hopefully reach an audience of interested people. Publishing on the web does have some negative aspects. I thought that blogging would stimulate discussion and scholarly give and take but it doesn’t seem to work that way. Some scholars even refuse to read anything on the web. Also, although archived, old posts seem to go into a black hole. Finally, I have found that even students who have asked for the papers or for other assistance rarely respond or even show gratitude. Do they take Incivility 101? But the positives certainly outweigh the negatives. Blogging stimulates thought and regular writing improves skills especially when you know others might read. Working on a paper or essay is like a prospector in a gold mine. He concentrates on the most promising vein but leaves behind many veins for later exploration. My major discoveries have uncovered a number of lesser ones that could not be published anywhere else. Working in the “sacred subject” vein has proven to be very productive. Just imagine what scholars with much more training, resources and expertise than I possess could achieve if they would work the same vein instead of merely giving into the temptation to call everything they cannot understand "allegory", "poesia", or "capriccio". ***Edit. Please note the baldachino above the man in the painting. It looks somewhat like an ornate lampshade. (click on the image to enlarge) David Orme, a friend from England and a lover of Venice, recently told me that he had seen similar ones in still existing statuary. Here is an image supplied by his friend, Albert Hickson. It is a statue of the Madonna and Child on the Rio Ognisanti near San Trovaso. Many thanks, David and Albert. My original intuition that Giorgione’s “Tempest” was actually a depiction of the “Rest on the Flight into Egypt” naturally led me to see the young man in the painting as St. Joseph standing guard over the Madonna and Child. But how could that be? Since Joseph was usually portrayed as a sleepy old man, I had to find evidence to corroborate Giorgione’s departure from tradition. A little investigation found a contemporary theological basis for a young, powerful Joseph who could be regarded as an able protector of his family and also as a protector of the Church. I also found that this young virile Joseph had also been depicted by some of Giorgione’s artist contemporaries, most notably by Raphael in the “Sposalizio”. 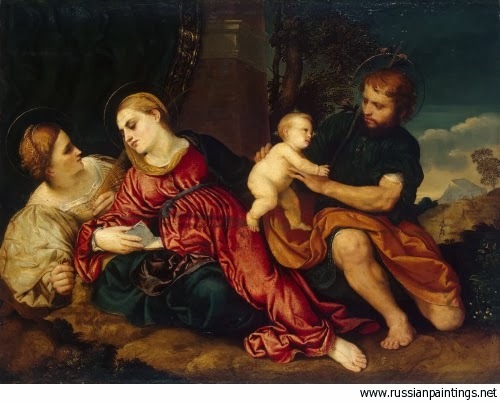 However, the failure to see a young Joseph has led scholars to misunderstand or even mis-identify some paintings that all feature a young, virile St. Joseph. In earlier posts I have discussed these paintings and would just like to summarize them here. First, Paris Bordone painted at least two versions of the “Mystic Marriage of Catherine of Alexandria” that depicted a powerful St. Joseph prominently displaying a muscular bare leg. 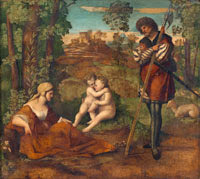 The first is in a private collection but was featured in the great 2006 “Bellini, Giorgione, Titian” exhibition that was jointly sponsored by Washington’s National Gallery and Vienna’s Kunsthistorisches Museum. * The second is in the Hermitage. There is no doubt concerning the subject of these paintings but so far no one has been able to explain the mystery of the muscular bare leg. I have argued that Bordone employed that device to indicate a contemporary practice used to “consummate” a marriage by proxy. In both of these paintings a young vigorous Joseph plays a very prominent role. Second, I have argued that the young man in a depiction of the “Mystic Marriage of St. Catherine” by Lorenzo Lotto is also St. Joseph. Modern scholars have seen the man as St. Mark or St. Thomas but there is no good reason for either of them to be present at that legendary event. But again, St. Joseph acts as a proxy and Catherine directs her gaze to him. It is the spear point at the end of Joseph’s traditional staff that has confused scholars. That is strange but the next two paintings might shed some light on this martial aspect. The second painting Wind called “The Peaceable Warrior (ex bello pax) and attributed it to Palma Vecchio. It is now in the possession of the Philadelphia Museum which will only label it “Allegory”. Like the first, it depicts a soldier with a halberd standing guard over a seated woman, but this time there are two young children embracing. 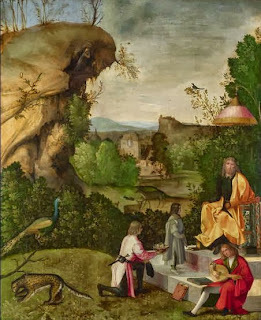 It is hard for me to believe that Wind and other scholars could have seen the two children and not at least considered the possibility that they are Jesus and the young Baptist embracing in the desert on the return of the Holy Family from Egypt, a scene depicted over and over again during the Renaissance. It is true that in both these paintings Joseph has taken on the trappings of a warrior capable of defending his family. 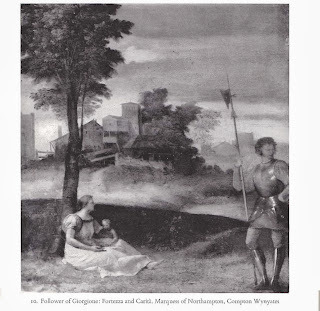 Actually both these paintings fit the description, "a soldier and a gypsy," that Marcantonio Michiel gave to the “Tempest” when he saw it in the home of Gabriele Vendramin. However, something has happened in a short space of time to turn the traditional staff in the hands of Giorgione’s man into the weapons depicted in these other paintings. It would seem more fruitful to try to understand the reasons for this change in the depiction of St. Joseph than to just pass these paintings off as allegories. In this and the previous two posts I have now listed 10 paintings in addition to the "Tempest" that have now been re-interpreted either completely or partially as a result of seeing Giorgione's most famous painting as a "sacred" subject. Others will be listed in future posts. This should serve as a lesson to all students struggling in the field of Art History. There is much more to be discovered in the world of Renaissance art. * See the exhibition catalog. 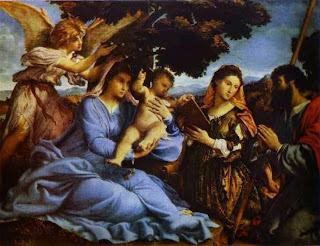 Brown, David Alan, and Ferino-Pagden, Sylvia, Bellini, Giorgione, Titian, and the Renaissance of Venetian Painting, Washington, 2006. ** Wind, Edgar: Giorgione’s Tempesta, Oxford, 1969.